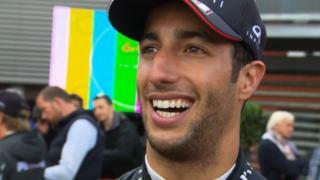 Belgian Grand Prix winner Daniel Ricciardo says if Mercedes slip up again then Red Bull will be ready to capitalise. Ricciardo is the only non Mercedes driver to win a race this season and again took first place after Nico Rosberg and Lewis Hamilton clashed early on after starting first and second on the grid respectively. Both Mercedes cars were damaged as the team-mates tangled and the Australian was quick to take advantage and grab his third win of the season.